Many years ago, shortly after creating a grocery budget and starting a side business at home to help the family pay off our debt, online shopping became popular. The fact that you could have stuff you wanted delivered to your front door and you didn’t have to get dressed, pack up kids, drive, fight traffic OR pay for gas was like Christmas every day. Back then I had heard about a relatively new rewards program called Ebates and signed up. I figured why not, right? We were trying to become debt free and every penny counted. Except that we didn’t earn pennies. We earned dollars. REAL dollars, and a lot of them! I’m totally not kidding when I say we earned dollars either. Every quarter Ebates sends out what they all a “Big Fat Check” and our first check was more than I had made doing the wooden nursery letter side gig. The crazy part was that I literally wasn’t doing any “work” – I just clicked through Ebates first and I automatically earned a percentage of my purchase back in cash! 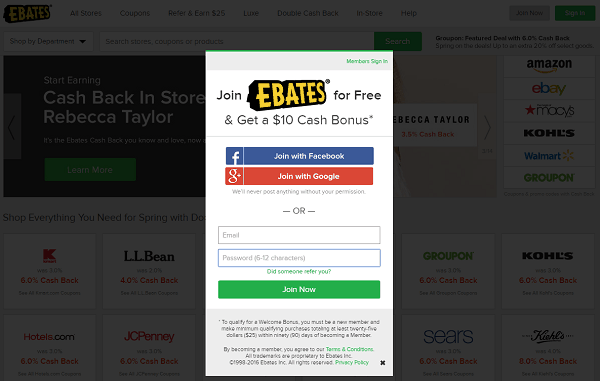 Ebates is a site that allows you to earn cash back by shopping through their links. Similar to Swagbucks, they partner with a variety of companies (Kohls, Amazon, Groupon and Walmart are just a few that are highlighted on their homepage right now), but you don’t have to do any activities to earn. You just shop like you normally would. First, you create an account. You do that by clicking HERE and following the prompts. Then you start shopping! As a bonus for being a new Ebates member, you earn $10 when you make a qualifying purchase of $25 within the first 90 days. Honestly, this is easy money folks. I can easily list $25 worth of items on my to-buy list at any given time of the year. Between birthdays, Christmas, replacing sheets, kid clothes – it’s the easiest $10 you’ll ever earn. But if by chance your finances are INCREDIBLY tight and you don’t have $25 to spare, no worries – use the gift cards you’ve earned through Swagbucks! 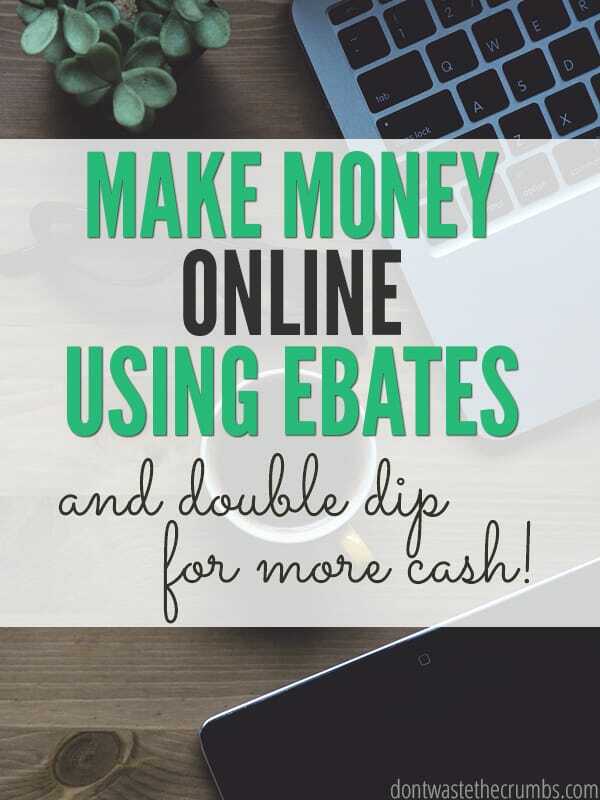 The best way to maximize your earnings is to visit Ebates before you checkout. It takes 5 seconds to check to see if the site you’re shopping from is listed, and there’s a good chance it is. Do this faithfully and you’ll be earning cash back every time. Personally I like to shop by going to the store sites to price compare, find the best deal and add items to my cart. Then I’ll go to Ebates and see which one has the better cash back offer. Then I click that link in Ebates and stay on that screen through checkout. 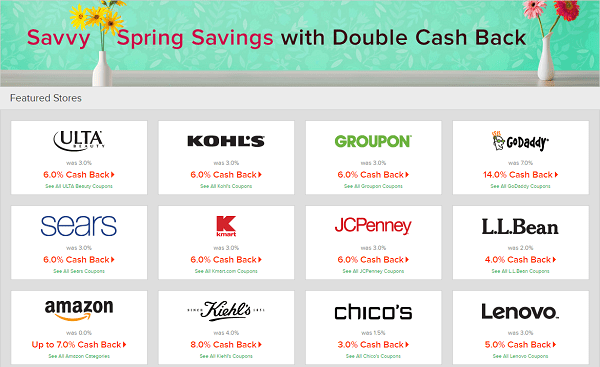 Another option is to shop the double cash back section. There will be an assortment of venders that are offering double the cash back. They’re always changing, so it’s good to check often. Don’t forget the hot deals to combine a coupon code and a cash back offer. For example, one of today’s deal is 25% off clearance at Macy’s plus 3% cash back. Consider shopping online instead of visiting the actual store. If you shop Petco or PetSmart, shop online and earn 8% or 4% cash back, respectively. The same goes for Walmart, Target, Old Navy and a ton of other stores. Be sure to take advantage of free “site to store” shipping deals too so you don’t pay for shipping! If you prefer to shop in-store rather than online, Ebates has recently added a way to save in-store too! Finally, install the Ebates app on your phone so if you make purchases on the go, you’re still able to save (and even make) money! With the option to double dip, you can not just save money, but actually MAKE money. I do this by earning free gift cards from Swagbucks )or buying discounted gift cards through Cardpool) and THEN shopping online through Ebates . For example, I’ve been working towards a new comforter set for our bedroom. I found a set I liked on Amazon for $50, so I’ve been earning Swagbucks and saving them up for $50 worth of gift cards. When I reach $50, I’ll visit Ebates first and shop through their link to earn 7% cash back (that’s the promotion as of this posting). I’ll use an Amazon gift card to pay for it (that I earned for free using Swagbucks) and I’ll get a check back from Ebates for $3.50 because I shopped through their link. So I actually MADE cash money using Ebates AND walked away with a new comforter set! You can also save by combining Ebates promo codes with their cash back offers. For example, there’s a promotion right now to save 15% at Kohls and earn 6% cash back. If I redeem my Swagbucks for a Kohls gift card, then I can once again make money. Using a similar $50 scenario, I can put $58 worth of items in my shopping cart and using a coupon for 15% off to bring my total down to $49.30. I then pay using the Kohls gift cards (again, that I earned for free using Swagbucks) and I’ll get a check back from Ebates for $2.96 because I shopped through their link. There’s no such thing as getting rich quick, but I can tell you that the little bits of cash back you earn over time really do add up! I’m actually kinda mad at myself at the moment because I’ve made several online purchases this past month and didn’t use Ebates. If I had, I would have earned at least $30 back – and that’s in just one month! And for just clicking through their link first! Do you use Ebates? If so, what’s the strangest items you’ve earned cash back on? Ooh – so glad you like them Deni! I just made them a “favorite” on my toolbar so I don’t forget either! Ebates now has a thing where their banner just pops up for you to click if they offer cash back on the site you’re shopping from. I can’t remember how I added it but if you go to the website I’m sure it will tell you. Hi, does this work for Canada too? Hi. It says that it does on their website. I am going to give this a try. Ebates cannot give cash back for the portion of a purchase that is made with gift cards or certificates. We can, however, give cash back on select gift cards purchased at stores via Ebates. To see a list of these stores, visit our Gift Card page. If using the Swagbucks search engine (on Chrome) and start shoping that also is an Ebates stores, do you earn SB and get the Ebates % with the ticket number that pops up? That’s a good question Katherine, and I’m not 100% sure. I have the SB extension on Chrome so when I’m on a site that’s eligible, a little pop-up shows up. I would start with Ebates, open a ticket and wait for the SB to pop up to try to take advantage of both. It’s worth a shot, and then following up to see if you were rewarded with both sites. I’ll try to do this the next time I buy something online, but let me know if you try it first, please! I’m right there with you Marie! When you shop online, always choose whatever gives you the best bang for buck. Sometimes it’s SB, sometimes it’s Ebates. Ibotta is a relatively new player to online shopping, but it’s worth to check there too b/c sometimes you can get deals on sites that aren’t on SB or Ebates. I use SB as my default search engine and do some of the daily to-do’s (they’ve added more over the years), and sometimes the videos play in the background while I’m researching something. That’s how I earn most of my SB. If you earn more shopping through SB than Ebates, go for it!